If you hang around on Masonic Facebook pages, blogs, and chatrooms for more than about five minutes, you’ll likely encounter some variation of this question: do Blue Lightnings/One-Day Classes/Short-form Catechisms shortchange new members? Do they experience “Real Masonry™” or “Cheap Masonry”? And, while there are sometimes thoughtful exchanges posted in response, too often what happens is a series of assertions that do not examine the question, but assert that it should take time and effort to become a Mason, and that the products of those classes/short catechisms will invariably drift away, to which others shout back, “I was the product of a one-day class, and I’m twice past master of my lodge.” And so on, ad infinitum. We came to Masonry by different routes, and the lessons we learned in our journeys continue to inform our attitude about the process. Our stories may be instructive. Todd: I really didn't have a choice--I was going through long form. Raymond VanBuskirk, a Past Master of the Lodge, told me in no uncertain terms that if I wanted his signature on the top line of my petition, I would "go through traditional" and learn the long form just as he had. I did want his signature, he had been like a grandfather to me when I was growing up, so I agreed. I spent six months memorizing the first and second degree catechisms. To this day, I think that "going through traditional" is the best way to go. I believe I got more from the experience by taking on that challenge. The difficulty in learning the catechisms and obligations is part of the experience, and should be--it shows the candidate’s true desire to join the Fraternity and his willingness to accomplish something that is very difficult to do. I'll also tell you it was one of the most difficult challenges I'd had up to that point, and having accomplished what I believed at times to be impossible made me a lot more open to taking on goals that seemed daunting in scale after I was raised a Master Mason. Michael: I tried to do that, and sat on my porch every night memorizing the first-degree catechism. I was two pages into it when the semester began, and work intruded (I’m a history professor). I simply didn’t seem to have the time or energy to memorize the remaining nine pages. Teaching, writing lectures, grading papers, and advising students (not to mention being the father to two young children) took up nearly all of my time. Then, in early October, a student of mine who’d been at my first degree came to my office and said, “I have something to make your life easier.” After realizing that no one had ever said those words to me (or since, come to think of it), I took the short-form catechism he’d brought with him and realized that I already knew the whole thing. I demonstrated my proficiency and was passed to the degree of Fellowcraft within two weeks, and was raised to the sublime degree of Master Mason the following month. While I’m sure that the experience of memorizing the long-form catechism would have been a splendid challenge, the short-form catechism enabled me to advance before I forgot why I petitioned for degrees in the first place. Todd: I'm a traditionalist. If I had to do it again knowing everything I know now, I'd probably go through exactly the same way. I've studied history most of my adult life, and part of what attracted me to Freemasonry to begin with was the idea of being part of something that was deeply traditional and hundreds of years old. But most of my motivation for going through traditional was the idea of experiencing something in the same way Raymond VanBuskirk had experienced it seventy years earlier in the same Lodge, and my great-grandfather Clarence Swengel had experienced it nearly a century before at Neoga Lodge. I wouldn't do it any differently, but I've come to know that the value I've taken from this Fraternity isn't in all those words I memorized long before I'd even attended a Lodge meeting. It was the first few steps of the journey itself that really mattered. Michael: I’ve had the honor of conferring many degrees, both in my own lodge and in others. The many Brethren whom I met at the Altar of Masonry professed to be deeply moved at the Work. I’ve also helped with Blue Lightnings, including one where we conferred Second and Third Degrees on fifteen candidates at the Danville, Illinois Masonic Temple (Illinois rules require that Blue Lightning candidates must receive their First Degrees in their home lodge). The logistics of a Blue Lightning are certainly different, but the Brethren who received their degrees that day proclaimed themselves delighted at finally proceeding in their Masonic journeys, and were deeply appreciative of the many Brethren who came to help. They seemed no less moved than the Brethren who received their degrees in the traditional way. What seemed to matter in both cases was the seriousness and brotherly love exhibited by the Brethren who came to help confer the degrees. Todd: There was a snowstorm the evening before my 3rd Degree--several inches of snow, thirty mile-per-hour winds, and icy snow drifted roads. By 5 that morning the wind had died down. My degree was scheduled for 10 o'clock. My wife and I spent a couple hours digging my truck out of the driveway, but all the while I was waiting for the call saying my degree would have to be rescheduled. The call never came, and so when I finally got my truck out, I made the treacherous trip to the lodge. It was full of men. Master Masons had come from several local lodges, and even Raymond, who was nearing ninety at the time, made it to the lodge for the degree. As any Master Mason will tell you, that experience is something they'll never forget. It was the same for me. When I left that day, I felt different. I wasn't just a Master Mason, but I was part of something and I knew it. All those men had braved the snow and the ice to provide me with that experience on a cold Saturday morning. I'd reached that goal I'd worked towards for six months, but I knew that wasn't it. I was just at the beginning of a journey--I'd merely taken the first three steps along a very long path. Michael/Todd: If you went through short form, you probably believe short form can have tremendous advantages for a candidate. If you go through long form, you'll most likely extoll the advantages of going through in the traditional way. But the question remains--is one way better than the other? As it turned out, even though Todd learned a lot of ritual in the very beginning, the precision and discipline of performing Lodge floor work has never been something he's excelled at even after hours of practice. As Senior Deacon during his Lodge's Rededication, he has the dubious honor of being the guy who smacked the Grand Master of the State of Illinois in the knee with his rod turning a poorly executed turn. After he served as Worshipful Master of his lodge, he took a comfortable seat behind the Secretary's desk where he plans on staying for a long, long time--there have been no injuries since he took that chair four years ago. Nearly all his contributions to Freemasonry are done behind the scenes--writing, organizing, managing. And Michael, who took the shortcut, has learned the ritual well enough to teach it. He's twice past Master of his lodge, is a Certified Lodge Instructor, and serves the Grand Lodge of Illinois as an Assistant Area Deputy Grand Master. So what’s the answer? Long form or short form? We’re not here to give you that answer. Maybe it's not even the right question to ask. Perhaps the question should be, which one is right for the candidate? We’re all different, and we learn in different ways. Some people learn to swim best by being thrown in at the deep end of the pool, while others would scream for the lifeguard and never go near water again. Some need to move quickly, whether because of the way they prefer to learn or because of the circumstances of their lives; others would be best served by careful lessons, starting in the shallow end, taking their time, and really absorbing everything before moving on to the next step on their Masonic journey. Some lodges, with healthy and active memberships, have programs for bringing new members along that sometimes starts well before they’re even allowed to petition. Other lodges haven’t the wherewithal to do that yet, and need to bring members along as quickly as they’re able. In both cases, focusing on the new Brother has to be at the center of their efforts. Arguing about long form versus short form or traditional versus Blue Lightning misses the point. 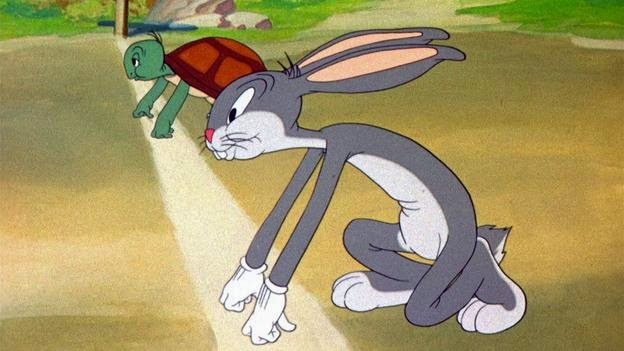 The parable of the tortoise and the hare is instructive, but it can also be misleading. We all wind up at the same finish line. What matters is the journey we take to get there. Slow and steady can win the race, particularly when pitted against fast and careless, but speed is not the issue: what matters is steady. However a new Brother best learns, whatever the circumstances of his life that may limit the time he can devote to learning his catechism, if his lodge is steady with him, he will be firmly grounded in Masonry. When our journey is done, that will have been what mattered. Its a question of expiriance in re-ality!!! ®eal Humanity as passport for journey!!! There's no real "one size fits all" for this question and, as mentioned in the main body, maybe it's not really the right question to begin with. Forcing a man to undergo the long form (or whatever) process JUST because that's the way WE did it is a sure-fire method for losing the man at some point - whether it is because he finds the entire process overwhelming, or because he's not READY to progress on OUR schedule.